“I wanted to make my own experience. It has been very enriching, because I have regained knowledge and learned other things. I also did it because of the situation we are living in, importing food and renouncing our staple foods,” she told IPS. Salvador began making tortillas in March, after harvesting four tons of blue-grain maize on two hectares of land on a family farm in the municipality of Juchitepec, in the state of Mexico, some 70 km southeast of the capital. 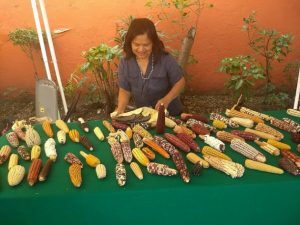 She sells them in her home in the municipality of Magdalena Contreras, one of the 16 boroughs that make up Mexico City, in the south of the capital, and is now thinking about buying a machine to expand her production. Salvador, who toured four states to learn about the process and has invested about 6,000 dollars, struggled to sell the product in her neighbourhood, but as buyers began to try it, demand started growing. The new Alliance for Our Tortilla, launched this month by organisations of food producers, corn planters and academics, is aimed at enterprises like hers. The aim is to promote the activity and spread a traditional form of low-cost nutrition in this country of 130 million inhabitants. The tortilla, in different presentations, has become part of the gastronomy of many other countries, but it is becoming less and less part of the everyday life of many Mexican tables. “New generations are losing the right to a quality tortilla. Consumption of tortillas in Mexico is dropping at an alarming rate, because the tortilla has changed, and there is easier access to processed food and junk food,” one of the promoters of the alliance, Rafael Mier, told IPS. “The alliance seeks to reverse this situation,” said Mier, who is the director of the non-governmental Mexican Corn Tortilla Foundation. The basic tenets of the alliance include the consumption of native grains, a fair price for tortillas, the defence of nixtamalisation – the ancestral technique for preparing maize to be made into tortillas – and the nutritional benefits of tortillas. In 2017, five non-governmental organisations launched the “I want my tortilla 100 percent nixtamalised” campaign, in another initiative to save the product in which members of the new alliance took part. Nixtamalisation, a combination of the Nahuatl words “nextli” (ash) and “tamalli” (corn dough), is the technique of cooking the grain with calcium hydroxide or lime, which dates back to the time before the arrival of the Spanish conquistadors in Mexico in the 15th century. This method neutralises aflatoxins, a type of micro-toxins produced by certain fungi in acrops such as maize, which can contaminate grains on the plant, during harvest or in storage, and can cause various types of cancer, according to scientific studies. In addition, the cooking opens the grain cuticle which releases vitamins and facilitates the absorption of nutrients during its consumption. The Mexican dough and tortilla industry encompasses around 80,000 establishments, including mills and tortilla factories or combinations of the two, accounting for one percent of the country’s GDP. With the nixtamalisation process, one kg of maize becomes two kg of dough. Maize is the staple food of Mesoamerica, the region that stretches from central Mexico down to Costa Rica. In Mexico, some 60 varieties of maize are grown, and the white, yellow, blue, red and bicolored grains – among others – are used to make tortillas. But consumption of tortillas has dropped to less than half in Mexico: from 170 kg a year per person in the 1970s to 75 kg today, as fast food has expanded and eating habits have changed. In February, official figures indicated that in the last year, adding the two harvest cycles, the country produced 23.8 million tonnes of white maize and imported 912,000 tonnes. Some12.9 million tonnes were used by people, of which 5.07 million were for self-consumption, and the rest was for export, seeds and livestock. The harvest of yellow corn, mainly destined for industrial use, amounted to additional 3.04 million tonnes, while imports reached a historic 14.37 million. Advocates say increasing tortilla consumption can help Mexico achieve its goals of ending poverty, reaching zero hunger, and boosting health, well-being, responsible production and consumption and healthy terrestrial ecosystems, within the 17 Sustainable Development Goals (SDGs) to be met by 2030. In 2016, when the SDGs began to be implemented, there were 53.4 million people living in poverty in Mexico, including 9.4 million in extreme poverty, according to the National Council for the Evaluation of Social Development Policy. There were a total 24.6 million undernourished people. In adolescents aged 12 to 19, the prevalence was 36 percent, and in adults aged 20 years and older, 72 percent. By contrast, the National Health and Nutrition Survey Mid-way 2016 found a prevalence of overweight and obesity in the five to 11 age group, of 33 percent that year. In adolescents aged 12 to 19, the prevalence was 36 percent and in adults aged 20 years and older, 72 percent. The survey also found, among the three age groups, low proportions of regular consumption of most of the recommended food groups, such as vegetables, fruits and legumes. Against this backdrop, several initiatives have emerged in the last two years to support the tortilla. José Castañón also went through a learning process in the southern state of Oaxaca to learn about the relationship between maize and tortillas. “I began to wonder: why not do something similar in Mexico City? I look for the junction between organic production, nutritional culture and fair trade. People come here because of values and health,” he told IPS. 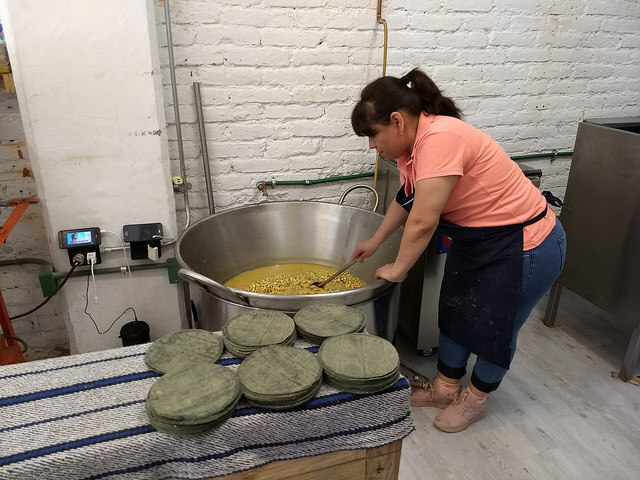 Parallel to his audiovisual work, Castañón inaugurated in November 2017 the “Cintli” (ear of corn in Nahuatl) tortilla factory in a western neighbourhood of the capital, where he sells white and blue grain products from the municipality of Vicente Guerrero, in the southern state of Tlaxcala, including 16 varieties of tortillas. The business, in which he has invested about 25,000 dollars and where two other people also work, processes about 70 kg of maize a day and sells retail tortillas to organic shops and restaurants, as well as dishes made with maize. For Mier, the solution lies in tackling the marketing and supply of the grain. “Talking about differentiated markets and paying a reasonable price, encouraging more tortilla factories to use native maize,” he said. According to Castañón, whose next move is to sell tortillas over the internet, it is necessary to promote the nutritional benefits of tortillas and the variety of flavours. “The issue must be put on the national agenda in an informed manner,” he said. The post Putting Tortillas on Mexico’s Tables Again appeared first on Inter Press Service. I guess this scum sleeps well at night but I can’t imagine why after attacking people who were attacked in the name of “defending” his client. The woman prosecutors say was raped by Harvey Weinstein had a 10-year consensual relationship with him before and after the incident, his lawyer said. mindless #Trumpdrone In addition to the racist tweet that ended her sitcom, the comedian falsely called the billionaire Jewish philanthropist a Nazi collaborator. The network’s decision to cancel “Roseanne” over a racist comment will cost it. But when people decide to let racism slide, it costs the rest of us. T-Mobile has hired former Trump campaign manager Corey Lewandowski to help the company gain regulatory approval for its $23 billion merger with Sprint. The looming merger has been blocked several times by regulators already because it would not only eliminate anywhere from 10 to 30,000 jobs but would dramatically reduce incentive for the remaning three large wireless carriers to seriously compete on price. As with most megamergers, the CEOs for Sprint and T-Mobile have spent the last few weeks trying to claim the exact opposite. British racism, is still racism even if a tiny bit less brutal than the Belgians, Germans, Japanese. Most of the people transported into slavery from what is now thought of as Africa, were transported to North, Central and South America in British and French ships. That is not something to be candied over with “we were not as brutal as the Belgian king.” Tearing apart families and enslaving people is brutal enough and needs to be healed not by candy but by admitting the wrong! It feels like I live in the middle of a culture war. On one side is a kind of state-sponsored amnesia. It’s pervasive. It’s an Oscar-winning movie perpetuating the idea that Winston Churchill stood alone, at the Darkest Hour, as Nazi fascism encroached, with Britain a small and vulnerable nation isolated in the north Atlantic. In reality the United Kingdom was at that moment an imperial power with the collective might of Indian, African, Canadian and Australian manpower, resources and wealth at its disposal. It’s also Poland passing a law so that errant historians, survivors or Auschwitz guides who raise the inconvenient fact of Polish complicity in atrocities now risk up to three years’ imprisonment. It’s Tennessee in the US legislating against the removal of Confederate statues when, as the former New Orleans mayor Mitch Landrieu puts it, they “purposefully celebrate a fictional, sanitised Confederacy; ignoring the death, ignoring the enslavement, and the terror that it actually stood for”. Russian journalist Arkady Babchenko has been shot in Kiev and has died of his wounds in an ambulance, according to Ukrainian police. Babchenko’s wife found him bleeding at the apartment on Tuesday and called an ambulance, but he died on the way to a hospital, a spokesman said. Just a few weeks ago, they lashed anti-Putin protesters in Moscow.